From the same makers of our Model 118 Violin, the Model 318 is a good choice for the player who wishes to upgrade to an instrument with a clearer, stronger tone without the higher price tag. 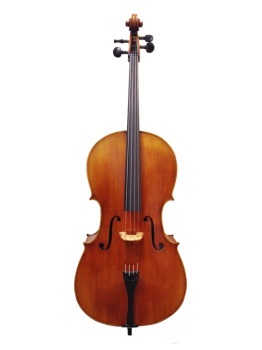 This cello, handmade and hand varnished in China, is a beautiful instrument with a robust sound. The finish is amber-brown, hand applied, spirit varnish. Adjustment includes ebony fingerboard, pegs, high quality endpin, composite tailpiece with built-in fine tuners, and D'Addario Prelude or Helicore strings.